Did Briana DeJesus break girl code when she allowed her Teen Mom 2 co-star Kailyn Lowry's baby daddy Javi Marroquin to stay at her hotel during a family vacation? Nope, according to Briana, who believes that in order to break girl code, you have to be friends first — denying she ever had a relationship with Kail beyond filming their MTV show. "No girl code was broken," she wrote on Twitter before deleting the tweets. "Kail was never my friend. I was always closer to Javi. I'm not here to make friends, I'm here to share my story and keep it moving." 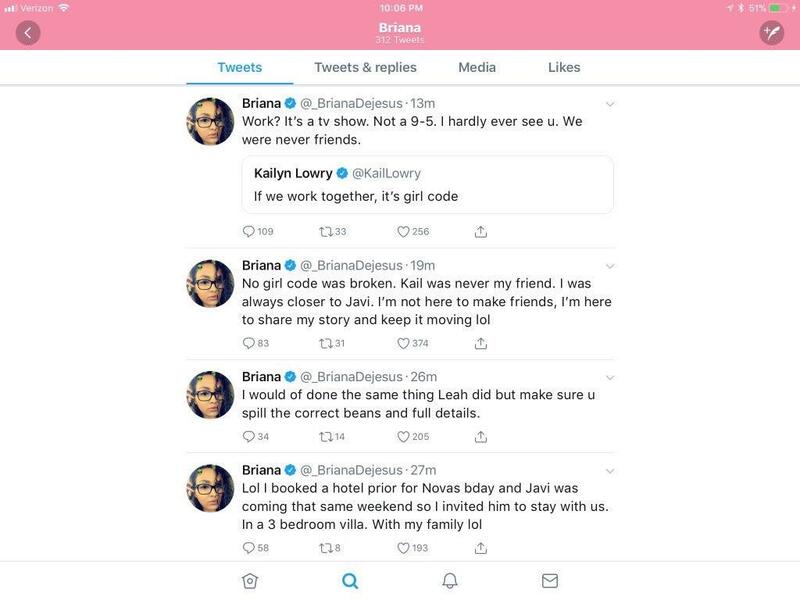 When Kail tried to assert girl code applies to people who work together, Brianna made it very clear she did not agree. "Work? It's a TV show. Not a 9-5," she added. "I hardly ever see u. We were never friends." Ouch. On Monday night's episode of the series, Brianna told Kail's BFF Leah Messer about her plans to travel to Orlando with her kids and invited Javi to stay at her hotel with his son, Lincoln, and Kail's oldest son, Isaac. However, she denied being romantically involved with Javi at the time. "He’s going to stay with us at the same hotel and resort and we’re just going to hang out with the kids," she said on the show. "So we’re just friends. I think. I think. I just don’t know how Kail’s going to feel about it." As expected, Kail was not happy when she found out about her baby daddy's secret travel plans. "I was told directly from Javi’s mouth that he is going with nobody but the boys to spend quality time with them," Kailyn told her first baby daddy Jo Rivera. "Now, Briana’s going, but he hasn’t told me Briana’s going. When I called him he told me it was none of my f–king business." She continued, "Why is he not just being honest? It doesn’t seem like something that you need to lie about?" Javi and Briana eventually started dating but their relationship was short-lived and they called it quits this past January. "I have no bad things to say to about him," Briana explained to Blasting News. "He wanted a wife and home right now and I didn’t see a reason to rush. I wish him the best going forward, and I am sad things panned out this way, but this is where things currently stand. Again, we are no longer together." And according to Urban Dictionary, girl code is "guidelines that girls most obey in order not to get kicked out of the community." So, sorry Briana, Kail is right this time around.